Doberman Pinschers have long been the face of the typical guard dog. Many popular movies over the last few decades have depicted these dogs as ferociously trained guardians, with spiked-metal collars and cropped, pointed ears. Though it is true that these dogs are protective by nature, as with most breeds, it is their training and owners that are the responsible for their behavior. 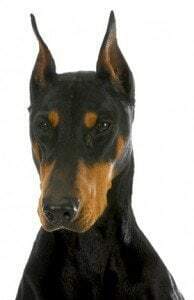 The Doberman Pinscher was reportedly created by Karl Friedrich Louis Dobermann, a German tax collector who wanted to breed the perfect guard dog. The breed has since lived up to its namesake expectations, being used as a guard dog as well as used in many service industries. The Doberman was used as a soldier dog in World War II. In fact, a Doberman named Kurt was said to have alerted 250 Marines of the approach of Japanese soldiers, possibly saving all of their lives. In addition, Doberman Pinschers have been long used in police work, used in search and rescue as well as other capacities. Dobermans are well-known for their long, sleek builds. Although they are born with floppy ears and long tails, their owners often have their ears cropped and tails docked, giving them a much more menacing appearance. Both procedures are cosmetic and unnecessary; many owners prefer to allow their dogs to have the softer look that these dogs are naturally born with. Unfortunately, any dog that is born and bred to be protective is often going to known to bite. Many Doberman Pinschers have also been trained to become attack dogs and have been portrayed that manner in popular media for many years. Although these dogs can be wonderful family dogs and fiercely loyal, they can also be very protective and dangerous. In comparison to many other breeds, the Doberman Pinscher is less likely to bite or attack. However, they are built for speed and if they do decide to attack, their human prey has little hope of outrunning these fast dogs. In the last 30 years, there have been 7 fatalities attributed to Dobermans, though very few maimings. Only 10 maimed victims were reported, almost as many as fatalities. What is striking about the Doberman Pinscher numbers is that when they do attack, they can be extremely deadly. These dogs are built to perform and are extremely fast and agile. Once they have determined that a person is a threat, that person is in danger for their life. A survivor of a Doberman Pinscher bite or attack is lucky to be alive. However, they may have severe injuries that will require medical attention. Victims may need wounds surgically repaired and once healed, they may be left with scarring and disfigurement. The costs, both financially and emotionally, for victims can be extensive. In most cases, owners of these dogs can be held liable to pay for any damages that were caused by an unprovoked attack. The Chicago dog bite attorneys at Rosenfeld Injury Lawyers LLC are ready to address any questions you have about your legal rights. Contact us today.